Silent Sky Project#6 November 9th 2005, 4.01 – 4.31 pm, 36 participants, Mexico City, Mexico. 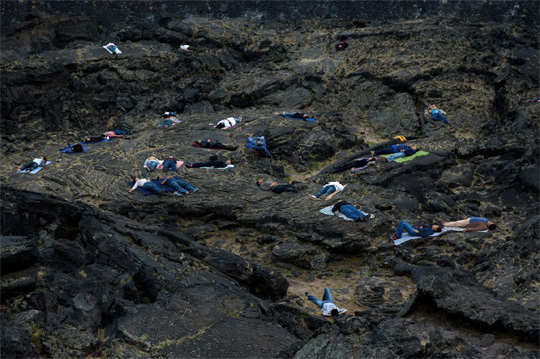 Lying on the original lavarock Mexico City is built on, 36 students of the university looked at the sky for 30 minutes, in silence. UNAM university, Mexico. Students and organising team of the 4 day workshop Rob Sweere conducted at the Artschool, ENAP, Mexico City. Location: El Espace Escultorico, UNAM university Mexico City, Mexico.